You may not know this, but I am a salsa freak. I will literally put a good salsa on just about anything. Eggs, burritos, chimichangas, chips, pork chops, chicken, burgers; nothing is safe from salsa in this house. I also love to try new products, so I was beyond excited when I came across Mrs. Renfro's awesome line of salsas, cheese sauces, relishes, barbecue sauces and more. This makes it perfect for game day spreads and if you are like me creating new things for breakfast, lunch, and dinner. Mrs. Renfro’s has tons of delicious recipes on their website that utilize their different products. I picked up 4 delicious products from Mrs. Renfro’s that I knew my family would love and just as I thought… they are a big hit. 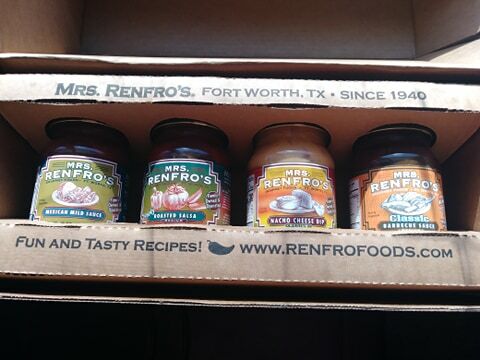 I recently received Mrs. Renfro’s Mexican Mild Salsa, Nacho Cheese Dip, Roasted Salsa, and Classic Barbecue Sauce. I personally liked them all, but I absolutely LOVED the Mexican Mild Salsa. I normally can't find a decent flavored salsa in stores, so I end up hitting up Taco Bell and snagging a bunch of their packets every week. So I was hoping that this one would be better than those. And boy was I surprised! The Mexican Mild Salsa is SO MUCH better than I expected. I love that it has simple ingredients, the flavor is great hot or cold. It went perfectly with my tacos, chips for dipping and even in my eggs! The Roasted Salsa was a little too smoky for my tastes, but the kids all loved it on grilled chicken. And have requested I purchase more for grilling in the summer. We had perfect nachos with the Nacho Cheese Dip, and the Hubby has requested it repeatedly for game nights with the boys. The Classic Barbecue Sauce has been this biggest hit with everyone else in the house. We've used it for dipping, marinating and grilling. It has a wonderfully smooth flavor. The kids compared it to McDonald's BBQ sauce but said that Mrs. Renfro's is definitely better quality and flavor. 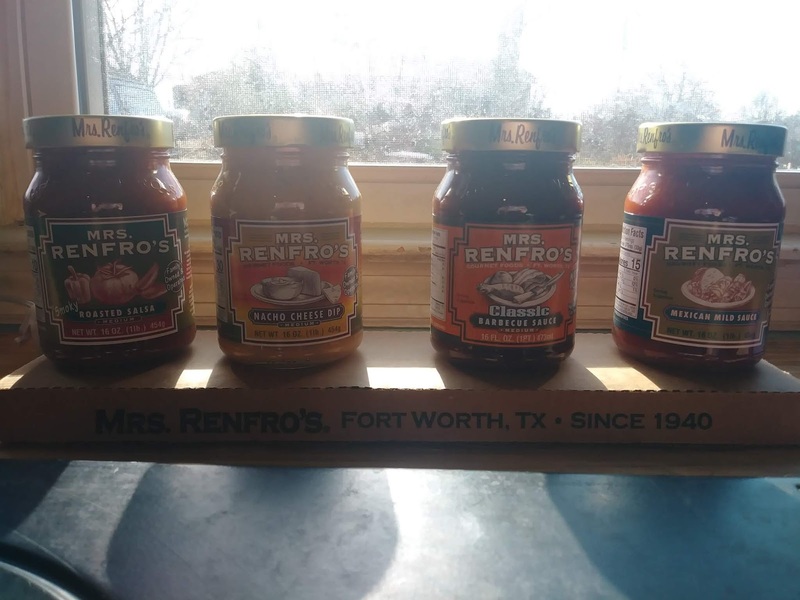 I am a bit sad to report that our local stores do not carry a wide variety of Mrs. Renfro's products, but I have been able to order from the website and compared to the prices in store; I feel I am getting a better deal. Especially since I can stock up on the ones we all loved at once! So what do you think of Mrs. Renfro’s line of delicious products? There are so many more products than what I chose, like Craft Beer Salsa, Nacho Sliced Jalapeno Peppers, Corn Relish, Ghost Pepper Nacho Cheese Sauce. and more. Plus they have delicious recipes available on their site as well so make sure you check them out. For 78 years, the Renfro family has been bringing you delicious and innovative products at affordable prices straight from Texas. I am most excited to try the nacho cheese dip and the craft beer salsa.